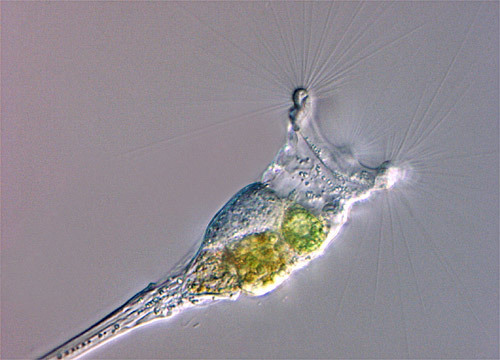 Collotheca belongs to the rotifer class Monogononta. These rotifers are sessile; they are either attached to each other forming a spherical colony, or attached individually to the substrate. Each rotifer secretes a gelatinous tube into which it withdraws when disturbed. After a period of time, it extends and the infundibulum opens like a blossom. Collotheca have extremely long tentacle-like cilia surrounding the corona. Although they are flexible enough to be folded up and pulled inside when the rotifer retreats into its tube, for feeding they are extended and appear to become rigid. Wavelike ripples along the cilia create currents that sweep smaller microorganisms into the mouth at the bottom of the infundibulum.